"Macao" redirects here. For other uses of "Macau" or "Macao", see Macau (disambiguation). "RAEM" redirects here. For the Final Fantasy character, see Final Fantasy Crystal Chronicles § Plot. Originally a sparsely populated collection of coastal islands, the territory has become a major resort city and the top destination for gambling tourism. It is the ninth-highest recipient of tourism revenue and its gaming industry is seven times larger than that of Las Vegas. Although the city has one of the highest per capita incomes in the world, it has severe income inequality. Macau has a very high Human Development Index and the fourth-highest life expectancy in the world. The territory is highly urbanised and most development is built on reclaimed land; two-thirds of total land area is reclaimed from the sea. The first known written record of the name "Macau", rendered as "Ya/A Ma Gang" ("亞/阿-媽/馬-港"), is in a letter dated 20 November 1555. The local inhabitants believed that the sea goddess Mazu (alternatively called A-Ma) had blessed and protected the harbour and called the waters around A-Ma Temple using her name. When Portuguese explorers first arrived in the area and asked for the place name, the locals thought they were asking about the temple and told them it was "Ma Kok" (媽閣). The earliest Portuguese spelling for this was Amaquão. Multiple variations were used until Amacão / Amacao and Macão / Macao became common during the 17th century, gradually standardising as Macao, and Macau today. Macau Peninsula had many names in Chinese, including Jing'ao (井澳/鏡澳), Haojing (濠鏡), and Haojing'ao (濠鏡澳). 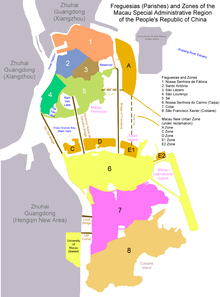 The islands Taipa, Coloane, and Hengqin were collectively called Shizimen (十字門). These names would later become Aomen (澳門), Oumún in Cantonese and translating as "bay gate" or "port gate", to refer to the whole territory. The region is first known to have been settled during the Han dynasty. However, Macau did not develop as a major settlement until the Portuguese arrived in the 16th century. The first European visitor to reach China by sea was the explorer Jorge Álvares, who arrived in 1513. Merchants first established a trading post in Hong Kong waters at Tamão (present-day Tuen Mun), beginning regular trade with nearby settlements in southern China. Military clashes between the Ming and Portuguese navies followed the expulsion of the Tamão traders in 1521. Despite the trade ban, Portuguese merchants continued to attempt settling on other parts of the Pearl River estuary, finally settling on Macau. Luso-Chinese trade relations were formally reestablished in 1554 and Portugal soon after acquired a permanent lease for Macau in 1557. The initially small population of Portuguese merchants rapidly became a growing city. The Roman Catholic Diocese of Macau was created in 1576, and by 1583, the Senate had been established to handle municipal affairs for the growing settlement. Macau was at the peak of its prosperity as a major entrepôt during the late 16th century, providing a crucial connection in exporting Chinese silk to Japan during the Nanban trade period. Although the Portuguese were initially prohibited from fortifying Macau or stockpiling weapons, the Fortaleza do Monte was constructed in response to frequent Dutch naval incursions. The Dutch attempted to take the city in the 1622 Battle of Macau, but were repelled successfully by the Portuguese. Macau entered a period of decline in the 1640s following a series of catastrophic events for the burgeoning colony: Portuguese access to trade routes was irreparably severed when Japan halted trade in 1639, Portugal revolted against Spain in 1640, and Malacca fell to the Dutch in 1641. Maritime trade with China was banned in 1644 following the Qing conquest under the Haijin policies and limited only to Macau on a lesser scale while the new dynasty focused on eliminating surviving Ming loyalists. While the Kangxi Emperor lifted the prohibition in 1684, China again restricted trade under the Canton System in 1757. Foreign ships were required to first stop at Macau before further proceeding to Canton. Qing authorities exercised a much greater role in governing the territory during this period; Chinese residents were subject to Qing courts and new construction had to be approved by the resident mandarin beginning in the 1740s. As the opium trade became more lucrative during the eighteenth century, Macau again became an important stopping point en route to China. Following the First Opium War and establishment of Hong Kong, Macau lost its role as a major port. Firecracker and incense production, as well as tea and tobacco processing, were vital industries in the colony during this time. Portugal was able to capitalise on China's post-war weakness and assert its sovereignty; the Governor of Macau stopped paying annual land rent and annexed Taipa and Coloane to the colony, in 1851 and 1864 respectively. Portugal also occupied nearby Lapa and Montanha, but these would be returned to China by 1887, when perpetual occupation rights over Macau were formalised in the Sino-Portuguese Treaty of Peking. This agreement also obligated Portugal from ceding Macau without Chinese approval. Despite occasional conflict between Cantonese authorities and the colonial government, Macau's status remained unchanged through the republican revolutions of both Portugal in 1910 and China in 1911. The Kuomintang further affirmed Portuguese jurisdiction in Macau when the Treaty of Peking was renegotiated in 1928. During the Second World War, the Empire of Japan did not occupy the colony and generally respected Portuguese neutrality in Macau. However, after Japanese troops captured a British cargo ship in Macau waters in 1943, Japan installed a group of government "advisors" as an alternative to military occupation. The territory largely avoided military action during the war except in 1945, when the United States ordered air raids on Macau after learning that the colonial government was preparing to sell aviation fuel to Japan. Portugal was later given over US$20 million in compensation for the damage in 1950. Refugees from mainland China swelled the population as they fled from the Chinese Civil War. Access to a large workforce enabled Macau's economy to grow as the colony expanded its clothing and textiles manufacturing industry, developed tourism, and legalised casino gaming. However, at the height of the Cultural Revolution, residents dissatisfied with the colonial administration rioted in the 1966 12-3 incident, in which 8 people were killed and over 200 were injured. Portugal lost full control over the colony afterwards, and agreed to cooperate with the communist authorities in exchange for continued administration of Macau. Following the 1974 Carnation Revolution, Portugal formally relinquished Macau as an overseas province and acknowledged it as a "Chinese territory under Portuguese administration." After China first concluded arrangements on Hong Kong's future with the United Kingdom, it entered negotiations with Portugal over Macau in 1986. They were concluded with the signing of the 1987 Joint Declaration on the Question of Macau, in which Portugal agreed to transfer the colony in 1999 and China would guarantee Macau's political and economic systems for 50 years after the transfer. In the waning years of colonial rule, Macau rapidly urbanised and constructed large-scale infrastructure projects, including Macau International Airport and a new container port. Macau was transferred to China on 20 December 1999, after 442 years of Portuguese rule. Following the transfer, Macau liberalised its casino industry (previously operating under a government-licensed monopoly) to allow foreign investors, starting a new period of economic development. The regional economy grew by a double-digit annual growth rate from 2002 to 2014, making Macau one of the richest economies in the world on a per capita basis. Political debates have centred on the region's jurisdictional independence and the central government's adherence of "one country, two systems". While issues such as national security legislation have been controversial, Macanese residents have generally high levels of trust in the government. Macau is a special administrative region of China, with executive, legislative, and judicial powers devolved from the national government. The Sino-Portuguese Joint Declaration provided for economic and administrative continuity through the transfer of sovereignty, resulting in an executive-led governing system largely inherited from the territory's history as a Portuguese colony. Under these terms and the "one country, two systems" principle, the Basic Law of Macao is the regional constitution. Because negotiations for the Joint Declaration and Basic Law began after transitional arrangements for Hong Kong were made, Macau's structure of government is very similar to Hong Kong's. Executive: The Chief Executive is responsible for enforcing regional law, can force reconsideration of legislation, and appoints Executive Council members, a portion of the legislature, and principal officials. Acting with the Executive Council, the Chief Executive can propose new bills, issue subordinate legislation, and has authority to dissolve the legislature. Legislature: The unicameral Legislative Assembly enacts regional law, approves budgets, and has the power to impeach a sitting Chief Executive. The Chief Executive is the head of government, and serves for a maximum of two five-year terms. The State Council (led by the Premier of China) appoints the Chief Executive after nomination by the Election Committee, which is composed of 400 business, community, and government leaders. The Legislative Assembly has 33 members, each serving a four-year term: 14 are directly elected, 12 indirectly elected, and 7 appointed by the Chief Executive. Indirectly elected assemblymen are selected from limited electorates representing sectors of the economy or special interest groups. All directly elected members are chosen with proportional representation. Twelve political parties had representatives elected to the Legislative Assembly in the 2017 election. These parties have aligned themselves into two ideological groups: the pro-establishment (the current government) and pro-democracy camps. Macau is represented in the National People's Congress by 12 deputies chosen through an electoral college, and 29 delegates in the Chinese People's Political Consultative Conference appointed by the central government. The Macau Government Headquarters is the official office of the Chief Executive. Chinese national law does not generally apply in the region, and Macau is treated as a separate jurisdiction. Its judicial system is based on Portuguese civil law, continuing the legal tradition established during colonial rule. Interpretative and amending power over the Basic Law and jurisdiction over acts of state lie with the central authority, however, making regional courts ultimately subordinate to the mainland's socialist civil law system. Decisions made by the Standing Committee of the National People's Congress can also override territorial judicial processes. The territory's jurisdictional independence is most apparent in its immigration and taxation policies. The Identification Department issues passports for permanent residents which differ from those of the mainland or Hong Kong, and the region maintains a regulated border with the rest of the country. All travellers between Macau and China and Hong Kong must pass border controls, regardless of nationality. Chinese citizens resident in mainland China do not have the right of abode in Macau, and are subject to immigration controls. Public finances are handled separately from the national government, and taxes levied in Macau do not fund the central authority. The Macao Garrison is responsible for the region's defence. Although the Chairman of the Central Military Commission is supreme commander of the armed forces, the regional government may request assistance from the garrison. Macau residents are not required to perform military service and current law also no provision for local enlistment, so its defence force is composed entirely of nonresidents. The central government and the Ministry of Foreign Affairs handle diplomatic matters, but Macau retains the ability to maintain separate economic and cultural relations with foreign nations. The territory negotiates its own trade agreements and actively participates in supranational organisations, including agencies of the World Trade Organization and United Nations. The regional government maintains trade offices in Greater China and other nations. The territory is divided into seven parishes. Cotai, a major area developed on reclaimed land between Taipa and Coloane, and areas of the Macau New Urban Zone do not have defined parishes. Historically, the parishes belonged to one of two municipalities (the Municipality of Macau or the Municipality of Ilhas) that were responsible for administering municipal services. The Civic and Municipal Affairs Bureau superseded the municipalities and is currently responsible for providing local services. ^ Including New District Zone B (新城B區). ^ Including New District Zone E (新城E區). Macau is on China's southern coast, 60 km (37 mi) west of Hong Kong, on the western side of the Pearl River estuary. It is surrounded by the South China Sea in the east and south, and neighbours the Guangdong city of Zhuhai to the west and north. The territory consists of Macau Peninsula, Taipa, and Coloane. A 1 km2 (0.39 sq mi) parcel of land in neighbouring Hengqin island that hosts the University of Macau also falls under the regional government's jurisdiction. The territory's highest point is Coloane Alto, 170.6 metres (560 ft) above sea level. Urban development is concentrated on peninsular Macau, where most of the population lives. The peninsula was originally a separate island with hilly terrain, which gradually became a tombolo as a connecting sandbar formed over time. Both natural sedimentation and land reclamation expanded the area enough to support urban growth. Macau has tripled its land area in the last century, increasing from 10.28 km2 (3.97 sq mi) in the late 19th century to 32.9 km2 (12.7 sq mi) in 2018. Cotai, the area of reclaimed land connecting Taipa and Coloane, contains many of the newer casinos and resorts established after 1999. The region's jurisdiction over the surrounding sea was greatly expanded in 2015, when it was granted an additional 85 km2 (33 sq mi) of maritime territory by the State Council. Further reclamation is currently underway to develop parts of the Macau New Urban Zone. The territory also has control over part of an artificial island to maintain a border checkpoint for the Hong Kong–Zhuhai–Macau Bridge. Macau has a humid subtropical climate (Köppen Cwa), characteristic of southern China. The territory is dual season dominant – summer (May to September) and winter (November to February) are the longest seasons, while spring (March and April) and autumn (October) are relatively brief periods. The summer monsoon brings warm and humid air from the sea, with the most frequent rainfall occurring during the season. Typhoons also occur most often then, bringing significant spikes in rainfall. During the winter, northern winds from the continent bring dry air and much less rainfall. The highest and lowest temperatures recorded at the Macao Meteorological and Geophysical Bureau are 38.9 °C (102.0 °F) on both 2 July 1930 and 6 July 1930 and −1.8 °C (28.8 °F) on 26 January 1948. The Statistics and Census Service estimated Macau's population at 653,100 at the end of 2017. With a population density of 21,340 people per square kilometre, Macau is the most densely populated region in the world. The overwhelming majority (88.7 per cent) is Han Chinese, many of whom originate from Guangdong (31.9 per cent) or Fujian (5.9 per cent). The remaining 11.6 per cent are non-ethnic Chinese minorities, primarily Filipinos, Vietnamese, and Portuguese. Macanese, native-born multiracial people with mixed Portuguese ancestry, make up a portion of the Portuguese population. A large portion of the population are Portuguese citizens, a legacy of colonial rule; at the time of the transfer of sovereignty in 1999, 107,000 residents held Portuguese passports. The predominant language is Cantonese, a variety of Chinese originating in Guangdong. It is spoken by 87.5 per cent of the population, 80.1 per cent as a first language and 7.5 per cent as a second language. Only 2.3 per cent can speak Portuguese, the other official language; 0.7 per cent are native speakers, and 1.6 per cent use it as a second language. Increased immigration from mainland China in recent years has added to the number of Mandarin speakers, making up about half of the population (50.4 per cent); 5.5 per cent are native speakers and 44.9 per cent are second language speakers. Traditional Chinese characters are used in writing, rather than the simplified characters used on the mainland. English is considered an additional working language and is spoken by over a quarter of the population (27.5 per cent); 2.8 per cent are native speakers, and 24.7 per cent speak English as a second language. Macanese Patois, a local creole generally known as Patuá, is now spoken only by a few in the older Macanese community. Among the religious population, Chinese folk religions have the most adherents (58.9 per cent) and are followed by Buddhism (17.3 per cent) and Christianity (7.2 per cent), while 15.4 per cent of the population profess no religious affiliation at all. Small minorities adhering to other religions (less than 1 per cent), including Hinduism, Judaism, and Islam, are also resident in Macau. 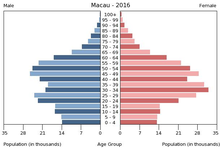 Life expectancy in Macau was 81.6 years for males and 87.7 years for females in 2018, the fourth highest in the world. Cancer, heart disease, and respiratory disease are the territory's three leading causes of death. Most government-provided healthcare services are free of charge, though alternative treatment is also heavily subsidised. Migrant workers living in Macau account for over 25 per cent of the entire workforce. They largely work in lower wage sectors of the economy, including construction, hotels, and restaurants. As a growing proportion of local residents take up employment in the gaming industry, the disparity in income between local and migrant workers has been increasing. Rising living costs have also pushed a large portion of non-resident workers to live in Zhuhai. Macau has a capitalist service economy largely based on casino gaming and tourism. It is the world's 83rd-largest economy, with a nominal GDP of approximately MOP433 billion (US$53.9 billion). Although Macau has one of the highest per capita GDPs, the territory also has a high level of wealth disparity. Macau's gaming industry is the largest in the world, generating over MOP195 billion (US$24 billion) in revenue and about seven times larger than that of Las Vegas. The regional economy is heavily reliant on casino gaming. The vast majority of government funding (79.6 per cent of total tax revenue) comes from gaming. Gambling as a share of GDP peaked in 2013 at over 60 per cent, and continues to account for 49.1 per cent of total economic output. The vast majority of casino patrons are tourists from mainland China, making up 68 per cent of all visitors. Casino gaming is illegal in both the mainland and Hong Kong, giving Macau a legal monopoly on the industry in China. Casino gambling was legalised in 1962 and the gaming industry initially operated under a government-licensed monopoly granted to the Sociedade de Turismo e Diversões de Macau. This license was renegotiated and renewed several times before ending in 2002 after 40 years. The government then allowed open bidding for casino licenses to attract foreign investors. Along with an easing of travel restrictions on mainland Chinese visitors, this triggered a period of rapid economic growth; from 1999 to 2016, Macau's gross domestic product multiplied by 7 and the unemployment rate dropped from 6.3 to 1.9 per cent. The Sands Macao, Wynn Macau, MGM Macau, and Venetian Macau were all opened during the first decade after liberalisation of casino concessions. Casinos employ about 24 per cent of the total workforce in the region. Export-oriented manufacturing previously contributed to a much larger share of economic output, peaking at 36.9 per cent of GDP in 1985 and falling to less than 1 per cent in 2017. The bulk of these exports were cotton textiles and apparel, but also included toys and electronics. At the transfer of sovereignty in 1999, manufacturing, financial services, construction and real estate, and gaming were the four largest sectors of the economy. Macau's shift to an economic model entirely dependent on gaming caused concern over its overexposure to a single sector, prompting the regional government to attempt re-diversifying its economy. The government traditionally had a non-interventionist role in the economy and taxes corporations at very low rates. Post-handover administrations have generally been more involved in enhancing social welfare to counter the cyclical nature of the gaming industry. Economic growth has been attributed in large part to the high number of mainlander visits to Macau, and the central government exercises a role in guiding casino business growth through its control of the flow of tourists. The Closer Economic Partnership Arrangement formalised a policy of free trade between Macau and mainland China, with each jurisdiction pledging to remove remaining obstacles to trade and cross-boundary investment. Due to a lack of available land for farming, agriculture is not significant in the economy. Food is exclusively imported to Macau and almost all foreign goods are transshipped through Hong Kong. Macau has a highly developed road system, with over 400 km (250 mi) of road constructed in the territory. Automobiles drive on the left (unlike in both mainland China and Portugal), due to historical influence of the Portuguese Empire. Vehicle traffic is extremely congested, especially within the oldest part of the city, where streets are the most narrow. Public bus services operate over 80 routes, supplemented by free hotel shuttle buses that also run routes to popular tourist attractions and downtown locations. About 1,500 black taxicabs are licensed to carry riders in the territory. The Hong Kong–Zhuhai–Macau Bridge provides a direct link with the eastern side of the Pearl River estuary. Cross-boundary traffic to mainland China may also pass through border checkpoints at the Portas do Cerco and Lótus Bridge. 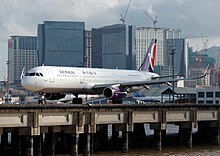 Macau International Airport serves over 8 million passengers each year and is the primary hub for local flag carrier Air Macau. The territory's first rail network, the Macau Light Rapid Transit, is currently under construction and expected to begin operations in 2019. The Taipa line will connect 11 metro stations throughout Taipa and Cotai. Ferry services to Hong Kong and mainland China operate out of Outer Harbour Ferry Terminal, Inner Harbour Ferry Terminal, and Taipa Ferry Terminal. Daily helicopter service is also available to Hong Kong and Shenzhen. Macau is served by one major public hospital, the Hospital Conde S. Januário, and one major private hospital, the Kiang Wu Hospital, both located in Macau Peninsula, as well as a university associated hospital called Macau University of Science and Technology Hospital in Cotai. In addition to hospitals, Macau also has numerous health centres providing free basic medical care to residents. Consultation in traditional Chinese medicine is also available. As of 2016[update] Macau healthcare authorities send patients to Queen Mary Hospital in Hong Kong in instances where the local Macau hospitals are not equipped to deal with their scenarios, and many Macau residents intentionally seek healthcare in Hong Kong because they place more trust in Hong Kong doctors than in Mainland-trained doctors operating in Macau. The main campus of the University of Macau is located in neighbouring Hengqin. Education in Macau does not have a single centralised set of standards or curriculum. Individual schools follow different educational models, including Chinese, Portuguese, Hong Kong, and British systems. Children are required to attend school from the age of five until completion of lower secondary school, or at age 15. Of residents aged 3 and older, 69.4 per cent completed lower secondary education, 49.2 per cent graduated from an upper secondary school, 21 per cent earned a bachelor's degree or higher. Mandatory education has contributed to an adult literacy rate of 96.5 per cent. While lower than that of other developed economies, the rate is due to the influx of refugees from mainland China during the post-war colonial era. Much of the elderly population were not formally educated due to war and poverty. Most schools in the territory are private institutions. Out of the 77 non-tertiary schools, 10 are public and the other 67 are privately-run. The Roman Catholic Diocese of Macau maintains an important position in territorial education, managing 27 primary and secondary schools. The government provides 15 years of free education for all residents enrolled in publicly-run schools, and subsidises tuition for students in private schools. Students at the secondary school level studying in neighbouring areas of Guangdong are also eligible for tuition subsidies. The vast majority of schools use Cantonese as the medium of instruction, with written education in Chinese and compulsory classes in Mandarin. A minority of private schools use English or Portuguese as the primary teaching language. Luso-Chinese schools mainly use Chinese, but additionally require mandatory Portuguese-language classes as part of their curriculum. Macau has ten universities and tertiary education institutes. The University of Macau, founded in 1981, is the territory's only public comprehensive university. The Kiang Wu Nursing College of Macau is the oldest higher institute, specialising in educating future nursing staff for the college's parent hospital. The University of Saint Joseph, Macau University of Science and Technology, and the City University of Macau were all established in subsequent years. Five other institutes specialise in specific vocations or provide continuing education. Macau preserves many historical properties in the urban area. The Historic Centre of Macau, which includes some twenty-five historic locations, was officially listed as a World Heritage Site by UNESCO on 15 July 2005 during the 29th session of the World Heritage Committee, held in Durban, South Africa. However, the Macao government is criticized for ignoring the conservation of heritage in urban planning. In 2007, local residents of Macao wrote a letter to UNESCO complaining about construction projects around world heritage Guia Lighthouse (Focal height 108 meters), including the headquarter of the Liaison Office (91 meters). UNESCO then issued a warning to the Macau government, which led former Chief Executive Edmund Ho to sign a notice regulating height restrictions on buildings around the site. In 2015, the New Macau Association submitted a report to UNESCO claiming that the government had failed to protect Macao's cultural heritage against threats by urban development projects. One of the main examples of the report is that the headquarter of the Liaison Office of the Central People's Government, which is located on the Guia foothill and obstructs the view of the Guia Fortress (one of the world heritages symbols of Macao). One year later, Roni Amelan, a spokesman from UNESCO Press service, said that the UNESCO has asked China for information and is still waiting for a reply. In 2016, the Macau government approved an 81-meter construction limit for the residential project, which reportedly goes against the city's regulations on the height of buildings around world heritage site Guia Lighthouse. Food in Macau is mainly based on both Cantonese and Portuguese cuisine, drawing influences from Indian and Malay dishes as well, reflecting a unique cultural and culinary blend after centuries of colonial rule. Portuguese recipes were adapted to use local ingredients, such as fresh seafood, turmeric, coconut milk, and adzuki beans. These adaptations produced Macanese variations of traditional Portuguese dishes including caldo verde, minchee, and cozido à portuguesa. While many restaurants claim to serve traditional Portuguese or Macanese dishes, most serve a mix of Cantonese-Portuguese fusion cuisine. Galinha à portuguesa and egg tarts are examples of Chinese dishes that draw from Macanese influences, but are not part of Macanese cuisine. Cha chaan teng, a type of fast casual diner originating in Hong Kong that serves that region's interpretation of Western food, are also prevalent in Macau. Pastel de nata, pork chop buns, and almond biscuits are popular street food items. Despite its small area, Macau is home to a variety of sports and recreational facilities that have hosted a number of major international sporting events, including the 2005 East Asian Games, the 2006 Lusophony Games, and the 2007 Asian Indoor Games. The territory regularly hosts the Macau Grand Prix, one of the most significant annual motorsport competitions that uses city streets as the racetrack. It is the only street circuit that hosts Formula Three, touring car, and motorcycle races in the same event. The Guia Circuit, with narrow corner clearance and a winding path, is considered an extremely challenging course and a serious milestone for prospective Formula One racers. Macau represents itself separately from mainland China with its own sports teams in international competitions. The territory maintains its own National Olympic Committee, but does not compete in the Olympic Games. Current International Olympic Committee rules specify that new NOCs can only be admitted if they represent sovereign states (Hong Kong has participated in the Olympics since before the regulation change in 1996). ^ a b For all government use, documents written using Traditional Chinese characters are authoritative over ones inscribed with Simplified Chinese characters. Portuguese shares equal status with Chinese in all official proceedings. ^ a b Population By-Census 2016, p. 6. ^ a b "Local NPC deputies' election slated for Dec 17". Macau News. 27 November 2017. Archived from the original on 3 January 2018. Retrieved 1 January 2018. ^ a b c Population Estimate 2017, p. 1. ^ a b c "Macao". International Monetary Fund. Retrieved 11 February 2019. ^ a b Macao in Figures 2018, p. 4. ^ a b Landler 1999. ^ du Cros 2009, p. 75. ^ a b c d e f g Sheng & Gu 2018, p. 72. ^ a b c Sheng & Gu 2018, pp. 77–78. ^ a b "Macau". The World Factbook. Central Intelligence Agency. Archived from the original on 9 January 2008. Retrieved 7 February 2019. ^ a b Grydehøj 2015, p. 102. ^ a b c Wu & Jin 2014. ^ Hao 2011, pp. 12–13. ^ a b Hao 2011, pp. 15–16. ^ Hao 2011, p. 15. ^ a b Hao 2011, p. 10. ^ a b Hao 2011, pp. 11–12. ^ a b Mendes 2013, p. 10. ^ Wills 1998, p. 348. ^ Garrett 2010, pp. 11–13. ^ Lourido 2000, p. 211. ^ Porter 1993, p. 8. ^ Sit, Cremer & Wong 1991, p. 10. ^ Hao 2011, p. 21. ^ Zhihong 2006, p. 8. ^ Zhihong 2006, pp. 8–10. ^ de Sousa 2009, p. 77. ^ de Sousa 2009, p. 75. ^ de Sousa 2009, pp. 77–78. ^ Sit, Cremer & Wong 1991, p. 11. ^ Sit, Cremer & Wong 1991, p. 12. ^ de Sousa 2009, p. 84. ^ a b de Sousa 2009, p. 79. ^ Luke 2000, p. 723. ^ Luke 2000, pp. 723–724. ^ a b Chan 2003, pp. 497–498. ^ Garrett 2010, p. 116. ^ Porter 1993, p. 9. ^ Chan 2003, p. 498. ^ Sit, Cremer & Wong 1991, p. 175. ^ Mendes 2013, pp. 7, 32. ^ Porter 1993, pp. 11–12. ^ Li 2016, p. 522. ^ Kwong & Wong 2017, pp. 123–124. ^ a b Castellucci 2012, pp. 674–675. ^ Chan 2003, pp. 506–507. ^ Krebs 2000, pp. 122–124. ^ Castellucci 2012, pp. 672–676. ^ a b Basic Law Chapter IV Article 50. ^ Basic Law Chapter IV Article 51. ^ Basic Law Chapter IV Article 58. ^ Basic Law Chapter IV Article 52. ^ Basic Law Chapter IV Article 71. ^ Basic Law Chapter IV Article 87. ^ Basic Law Chapter VIII Article 143. ^ Basic Law Chapter IV Article 48. ^ Chief Executive Election Results 2014. ^ Basic Law Chapter IV Article 47. ^ Chan 2003, p. 506. ^ Yu & Chin 2012, pp. 97–98. ^ Yu & Chin 2012, p. 103. ^ Legislative Assembly Election Results 2017. ^ Li 2016, pp. 527–528. ^ Castellucci 2012, pp. 675–677. ^ Law No. 8/1999, Law about Permanent Resident and Right of Abode in the Macao Special Administrative Region. ^ "Entry Requirements - Passports and Visas". Tourism Office. Archived from the original on 9 February 2019. Retrieved 7 February 2019. ^ Basic Law Chapter III Article 24. ^ Basic Law Chapter V Article 104. ^ Wang 2018, p. 171. ^ Basic Law Chapter II Article 12. ^ "Macao, China in the WTO". World Trade Organization. Archived from the original on 9 February 2019. Retrieved 7 February 2019. ^ "ESCAP Member States and Associate Members". United Nations Economic and Social Commission for Asia and the Pacific. Archived from the original on 28 December 2018. Retrieved 7 February 2019. ^ "List of Agreements Concluded by the Macao SAR Government under Authorization by the Central People's Government". Office of the Commissioner of the Ministry of Foreign Affairs of the People's Republic of China in the Macao Special Administrative Region. Archived from the original on 9 February 2019. Retrieved 7 February 2019. ^ External Relations Facts 2018. ^ a b c d e "Area of parishes". Cartography and Cadastre Bureau. Archived from the original on 29 September 2018. Retrieved 7 February 2019. ^ Law No. 9/2018, Creation of the Institute for Municipal Affairs. ^ a b Mok & Hoi 2005, p. 202. ^ Huang, Ho & Du 2011, p. 354. ^ a b c d Sheng & Gu 2018, p. 76. ^ Population By-Census 2016, p. 10. ^ Sheng, Tang & Grydehøj 2017, pp. 202–203. ^ Mok & Ng 2015. ^ "Instalações do posto fronteiriço" [Border Facilities] (in Portuguese). Transport Bureau. Archived from the original on 15 February 2019. Retrieved 14 February 2019. ^ Mok & Hoi 2005, p. 220. ^ "Macao Climate: Extreme Value of some meteorological elements (1901-2017)". Macao Meteorological and Geophysical Bureau. Archived from the original on 29 May 2018. Retrieved 17 February 2019. ^ "Macao Climate: 30-year Statistics of some meteorological elements". Macao Meteorological and Geophysical Bureau. Retrieved 29 March 2017. ^ "Macao Climate: Extreme Value of some meteorological elements (1901-2016)". Macao Meteorological and Geophysical Bureau. Retrieved 29 March 2017. ^ Population By-Census 2016, p. 14. ^ Population By-Census 2016, p. 47. ^ Hook & Neves 2002, p. 119. ^ Basic Law Chapter I Article 9. ^ a b Population By-Census 2016, pp. 9, 53–54. ^ Moody 2008, p. 6. ^ "Religions in Macau". Pew Research Center. Archived from the original on 9 February 2019. Retrieved 7 February 2019. ^ "Life Expectancy at Birth". The World Factbook. Central Intelligence Agency. Archived from the original on 20 January 2016. Retrieved 7 February 2019. ^ a b Population By-Census 2016, p. 15. ^ Monetary Authority Annual Report 2017, p. 64. ^ Tourism Statistics 2017, p. 61. ^ Godinho 2014, p. 4. ^ a b Sheng & Gu 2018, p. 74. ^ Sit 1991, p. 68. ^ Macao Industrial Structure 2017. ^ Sit 1991, pp. 70–71. ^ Sheng & Gu 2018, pp. 78–80. ^ Sit, Cremer & Wong 1991, p. 176. ^ Lo 2009, p. 17. ^ Lo 2009, pp. 37–41. ^ Sheng & Gu 2018, pp. 75–76. ^ "Mainland and Macao Closer Economic Partnership Arrangement (CEPA) Overview". Economic Bureau. Archived from the original on 13 February 2019. Retrieved 12 February 2019. ^ Macau USDA Report 2018. ^ McManus 2004, p. 248. ^ Sheng, Tang & Grydehøj 2017, p. 205. ^ Teng et al. 2017, p. 117. ^ Macao Yearbook 2018, p. 418. ^ Griffiths & Lazarus 2018. ^ Macao Yearbook 2018, pp. 421–422. ^ Macao Yearbook 2018, pp. 426–429. ^ "About Macau Light Rapid Transit (MLRT)". MTR Corporation. Archived from the original on 17 February 2019. Retrieved 15 February 2019. ^ Macao Yearbook 2018, pp. 421–423. ^ "Macau Factsheet". The Govt. of Macau SAR. Archived from the original on 14 November 2007. Retrieved 13 November 2007. ^ Macau 2007 Yearbook. Government Information Bureau of Macau SAR. 2007. ISBN 978-99937-56-09-5. ^ "Macau Polytechnic Institute General Information". Macau Polytechnic Institute. Archived from the original on 18 December 2007. Retrieved 3 December 2007. ^ "Homepage of the College of Nursing and Midwifery". College of Nursing and Midwifery, Macau. Retrieved 13 November 2007. ^ a b Yau, Elaine (12 September 2016). "Why Macau spends millions to send its patients to Hong Kong – some by air". South China Morning Post. Archived from the original on 9 April 2017. Retrieved 9 April 2017. - Print title: "Patients running out"
^ "The introduction of Health Bureau, Macau SAR". The Govt. of Macau SAR. Archived from the original on 12 September 2007. Retrieved 13 November 2007. ^ "The policy and functions of the department of health, Macau SAR". The Govt. of Macau SAR. Archived from the original on 12 September 2007. Retrieved 13 November 2007. ^ a b Tang & Bray 2000, pp. 473–474. ^ Population By-Census 2016, p. 8. ^ Population By-Census 2016, p. 9. ^ a b Macao Yearbook 2018, p. 289. ^ "Educational establishments". Roman Catholic Diocese of Macau. Archived from the original on 20 February 2019. Retrieved 19 February 2019. ^ Macao Yearbook 2018, p. 291. ^ Macao Yearbook 2018, pp. 298, 304–307. ^ "Grand Prix Macau". Macau Grand Prix Committee. Archived from the original on 26 February 2008. Retrieved 4 January 2008. ^ "Macau Festivals & Events". AsiaRooms.com. Archived from the original on 29 December 2007. Retrieved 4 January 2008. ^ a b "Macau Geography". AsiaRooms.com. Archived from the original on 12 January 2008. Retrieved 6 January 2008. ^ "Mostar, Macau and Biblical vestiges in Israel are among the 17 cultural sites inscribed on UNESCO's World Heritage List". UNESCO. Archived from the original on 13 August 2006. Retrieved 5 September 2006. ^ YU, Eilo W.Y. ; CHAN, Ming K. (2014). China's Macao Transformed: Challenge and Development in the 21st Century. City University of HK Press. p. 316. ISBN 978-9629372071. ^ a b c "New Macau alerts UN to construction project near lighthouse". Macau Daily Times. 8 November 2016. Archived from the original on 3 February 2018. ^ Meneses, J. (2016). The Victory of Heritage. Macau Business, July 2016, pp.72-73. ^ Long 2015, p. 389. ^ a b Long 2015, p. 390. ^ Long 2015, p. 391. ^ Shadbolt, Peter (7 November 2013). "Macau Grand Prix: The final exam for racers". CNN. Retrieved 27 February 2019. ^ Mallon & Heijmans 2011, p. 211. ^ "Exchanges between IACM and other cities" (PDF). Civic and Municipal Affairs Bureau. Archived (PDF) from the original on 9 February 2019. Retrieved 8 February 2019. 2016 Population By-Census Detailed Results (Report). Statistics and Census Service. May 2017. "Public finance" (PDF). Annual Report 2017 (Report). Monetary Authority of Macao. 2017. Eleição do Chefe do Executivo [Election of the Chief Executive] (PDF) (Report) (in Portuguese). Electoral Affairs Commission. 31 August 2014. External Relations (PDF) (Report). Government Information Bureau. July 2018. Healthcare (PDF) (Report). Government Information Bureau. July 2018. Macao in Figures (Report). Statistics and Census Service. Retrieved 19 February 2019. Macao Industrial Structure (Report). Statistics and Census Service. November 2018. Macau Food and Agricultural Import Regulations and Standards Report (PDF) (Report). United States Department of Agriculture. 6 July 2018. Population Estimate 2017 (Report). Statistics and Census Service. March 2018. Resultado da Eleição dos Deputados à Assembleia Legislativa da Região Administrativa Especial de Macau por Sufrágio Directo e Indirecto [Result of the Election of Members of the Legislative Assembly of the Macao Special Administrative Region by Direct and Indirect Suffrage] (PDF) (Report) (in Portuguese). Electoral Affairs Commission. 26 September 2017. Tourism Statistics (Report). Statistics and Census Service. April 2018. Castellucci, Ignazio (June 2012). "Legal Hybridity in Hong Kong and Macau". Journal of Contemporary China. 57 (4): 665–720. doi:10.7202/1013028ar. Chan, Ming K. (2003). "Different Roads to Home: The retrocession of Hong Kong and Macau to Chinese sovereignty" (PDF). Journal of Contemporary China. 12 (36): 493–518. doi:10.1080/10670560305473. de Sousa, Trigo (2009). "Macau in the Colonial Period (1557-1949)" (PDF). Regional integration and differentiation in a globalizing China: the blending of government and business in post-colonial Macau (PhD thesis). University of Amsterdam. du Cros, Hilary (2009). "Emerging Issues for Cultural Tourism in Macau". Journal of Current Chinese Affairs. 38 (1): 73–99. doi:10.1177/186810260903800105. Godinho, Jorge (2 June 2014). "Casino Gaming in Macau: Evolution, Regulation and Challenges". UNLV Gaming Law Journal. 5 (1): 1–26. Grydehøj, Adam (2015). "Making Ground, Losing Space: Land Reclamation and Urban Public Space in Island Cities". Urban Island Studies. 1: 96–117. doi:10.20958/uis.2015.6. Hook, Brian; Neves, Miguel Santos (March 2002). "The Role of Hong Kong and Macau in China's Relations with Europe". The China Quarterly. 169 (1): 108–135. doi:10.1017/S0009443902000086. JSTOR 4618708. Huang, Jinliang; Ho, Manhim; Du, Pengfei (2011). "Assessment of temporal and spatial variation of coastal water quality and source identification along Macau peninsula". Stochastic Environmental Research and Risk Assessment. 25 (3): 353–361. doi:10.1007/s00477-010-0373-4. Krebs, Judith R. (2000). "One Country, Three Systems? Judicial Review in Macau after Ng Ka Ling". Pacific Rim Law & Policy Journal. 10 (1): 111–146. hdl:1773.1/780. Kwong, Ying-ho; Wong, Matthew Y.H. (2017). "State size and democratization in hybrid regimes: the Chinese island cities of Macau and Hong Kong" (PDF). Island Studies Journal. 12 (2): 113–126. Li, Sheng (2016). "The transformation of island city politics: The case of Macau" (PDF). Island Studies Journal. 11 (2): 521–536. Lo, Sonny (2009). "Casino Capitalism and Its Legitimacy Impact on the Politico-administrative State in Macau". Journal of Current Chinese Affairs. 38 (1): 19–47. doi:10.1177/186810260903800103. Luke, Frances M. (2000). "The Imminent Threat to China's Intervention in Macau's Autonomy: Using Hong Kong's Past to Secure Macau's Future". American University International Law Review. 15 (3): 717–756. Mok, K.M. ; Hoi, K.I. (2005). "Effects of Meteorological Conditions on PM10 Concentrations – A Study in Macau". Environmental Monitoring and Assessment. 102: 201–223. doi:10.1007/s10661-005-6022-6. Moody, Andrew (September 2008). "Macau English: status, functions and forms". English Today. 24 (3): 3–15. doi:10.1017/S0266078408000242. Porter, Jonathan (1993). "The Transformation of Macau". Pacific Affairs. 66 (1): 7–20. doi:10.2307/2760013. Sheng, Mingjie; Gu, Chaolin (2018). "Economic growth and development in Macau (1999–2016): The role of the booming gaming industry". Cities. 75: 72–80. doi:10.1016/j.cities.2018.01.003. Sheng, Ni; Tang, U Wa; Grydehøj, Adam (2017). "Urban morphology and urban fragmentation in Macau, China: island city development in the Pearl River Delta megacity region". Island Studies Journal. 12 (2): 199–212. doi:10.24043/isj.25. Sit, Victor F.S. (1991). "Evolution of Macau's Economy and Its Export-Oriented Industries". Copenhagen Journal of Asian Studies. 6: 63–88. doi:10.22439/cjas.v6i1.1799. Tang, Kwok-Chun; Bray, Mark (2000). "Colonial Models and the Evolution of Education Systems: Centralization and Decentralization in Hong Kong and Macau". Journal of Educational Administration. 38 (5): 468–485. doi:10.1108/09578230010378368. hdl:10722/42080. Teng, Lawrence Iat Loi; Siu, Amy Ian So; Lo, Iris Sheungting; Fong, Lawrence Hoc Nang (2017). "Does the quality of tourist shuttles influence revisit intention through destination image and satisfaction? The case of Macao". Journal of Hospitality and Tourism Management. 32: 115–123. doi:10.1016/j.jhtm.2017.06.002. Yu, Elio Wing-yat; Chin, Natalie Ka-man (2012). "The Political Opposition and Democracy in Macao: Revolutionaries or Loyalists?". Government and Opposition. 47 (1): 97–116. doi:10.1111/j.1477-7053.2011.01356.x. JSTOR 26350258. "Criação do Instituto para os Assuntos Municipais" [Creation of the Institute for Municipal Affairs]. Act No. 9 of 2018 (PDF) (in Portuguese). "Lei sobre Residente Permanente e Direito de Residência na Região Administrativa Especial de Macau" [Law about Permanent Resident and Right of Abode in the Macao Special Administrative Region]. Act No. 8 of 1999 (PDF) (in Portuguese). Garrett, Richard J. (2010). The Defences of Macau: Forts, Ships and Weapons over 450 years. Hong Kong University Press. ISBN 978-988-8028-49-8. Hao, Zhidong (2011). Macau History and Society. Hong Kong University Press. ISBN 978-988-8028-54-2. Lourido, Rui D'Avila (2000). "The impact of the Silk trade: Macau - Manila, from the beginning to 1640". In Elisseeff, Vadime (ed.). The Silk Roads: Highways of Culture and Commerce. Berghahn Books. pp. 209–247. ISBN 978-1-57181-222-3. Macao Yearbook Editorial Team (2018). Macao Yearbook (PDF). Government Information Bureau. ISBN 978-999-3756-44-6. McManus, Chris (2004). Right Hand, Left Hand: The Origins of Asymmetry in Brains, Bodies, Atoms and Cultures. Harvard University Press. ISBN 978-067-4016-13-2. Mallon, Bill; Heijmans, Jeroen (2011). Historical Dictionary of the Olympic Movement. Rowman & Littlefield. ISBN 978-0-8108-7249-3. Mendes, Carmen Amado (2013). Portugal, China and the Macau Negotiations, 1986-1999. Hong Kong University Press. ISBN 978-988-8139-00-2. Sit, V.F.S. ; Cremer, R.; Wong, S.L. (1991). Entrepreneurs and Enterprises in Macau: A Study of Industrial Development. Hong Kong University Press. ISBN 962-209-206-3. Wang, Zhenmin (2018). Relationship Between the Chinese Central Authorities and Regional Governments of Hong Kong and Macao: A Legal Perspective. Springer. doi:10.1007/978-981-13-2322-5. ISBN 978-981-13-2320-1. Wu, Zhiliang; Jin, Guoping (2014). "The evolution of spellings of 'Macau': An examination of early Portuguese and Western archival materials.". In Wong, Katrine K.; Wei, C.X. George (eds.). Macao – Cultural Interaction and Literary Representations. Routledge. pp. 147–168. ISBN 978-0-415-62586-9. Beitler, Daniel (4 January 2019). "The State of Land Reclamation". Macau Daily Times. Retrieved 14 February 2019. Ho, Maggie (31 August 2018). "Beijing considers letting HK residents join PLA". RTHK. Retrieved 6 March 2019. Landler, Mark (20 December 1999). "Portugal Lowers Its Flag, Handing Macao to China". The New York Times. Retrieved 13 February 2019. Mok, Danny; Ng, Teddy (17 December 2015). "Macau to extend land and sea administrative area". South China Morning Post. Retrieved 14 February 2019. Yiu, Enoch (20 September 2010). "Macau's buildings safe, but culture collapsing". South China Morning Post. Retrieved 25 February 2019. "Macau". The World Factbook. Central Intelligence Agency. This page was last edited on 23 April 2019, at 13:24 (UTC).